New Beginnings and a New Year ! Wishing you health, happiness & peace in the New Year. A summer day in the lakes region of New Hampshire. Cloud patterns on the mountains! I don’t know if your past year has been like this but it feels like time is racing by and I’ve been playing catch up for the last 3 months ! I am finally almost up to date with all the important things on my calendar. It’s been a whirlwind year with little time off. Whenever I did have a few open days it was to regroup or catch up or prepare for the next event on my schedule. The good news? Its been fun, rewarding and so enriching. And I’m being recruited to teach painting in lovely places like Italy. Would you like to come with me to Italy to paint near the birth place of Raphael? 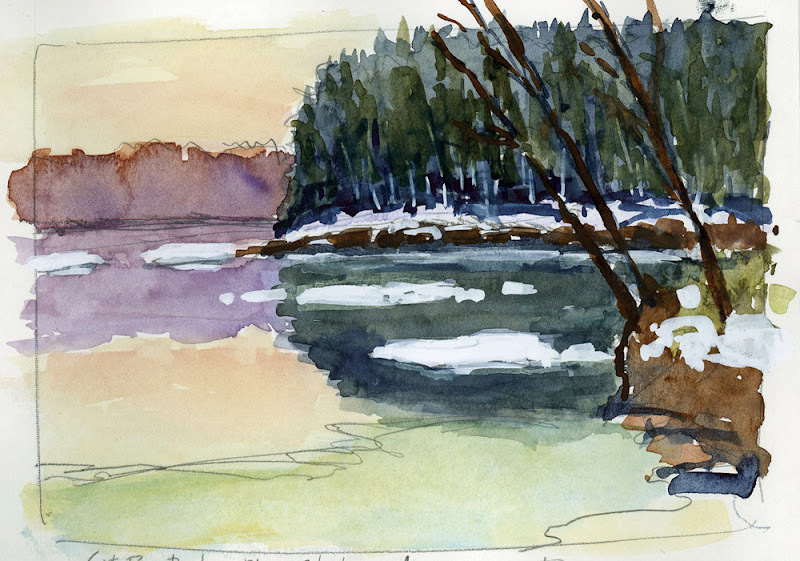 Or maybe take a mini vacation to sketch and paint for a long weekend in Quebec City? These are a few possibilities of sketching & painting adventures for 2020. Spring 2018 Sketchbook class on a bright sunny day. You all are the best! Plus, due to popular demand, I will be releasing one of my first online classes, “Color” in 2019. The filming and production of this is one of the extra things I’ve been trying to fit into my already active schedule. Also, I will be publishing my first book & color mixing guide in 2019 ! I promise , I will try to post more regularly to my blog to keep you updated on everything. My blog might show up from time to time as a vlog as I am able to post my painting & plein air videos quickly and easily. It’s been harder to find the time to sit down and write. I hope all of you are catching your breath after your adventures of 2018 and looking forward to a enriching new year. I want to thank all of you for your friendship, support and positive messages in 2018. I’m wishing you all the best for 2019 ! 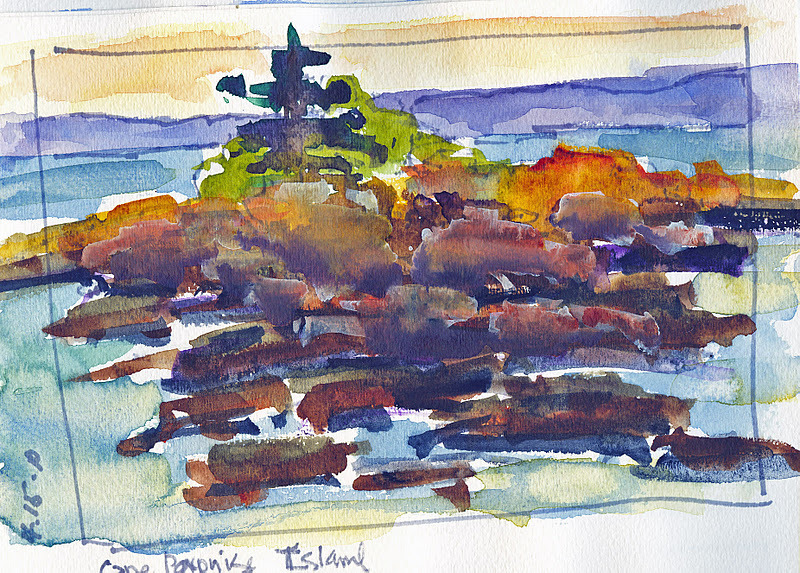 Plein Air Painting in Maine ~ Summer Is coming! SUMMER PLEIN AIR PAINTING ! YES, SUMMER IS COMING AND ITS TIME TO GRAB YOUR TIME IN THE SUN ! IF YOU HAVE BEEN THINKING ABOUT GETTING OUT UNDER THE OPEN SKY TO PAINT THE LANDSCAPE…. NOW IS THE TIME ! 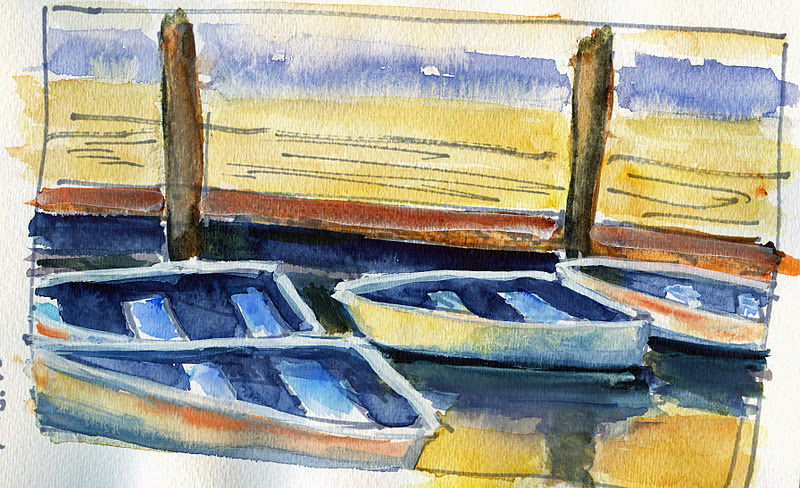 THIS CLASS IS PERFECT FOR BEGINNERS TO INTERMEDIATE PAINTERS. The 2018 Summer Plein Air Painting Class is an outdoor painting class. A new location every week. Student may work in oils, acrylics or gouache. Students will need to have a plein air easel and painting kit that they can carry or transport easily on location. JUNE, JULY, AUGUST ~Monthly 4 week session. For beginners to intermediate painters. Capture the essence of the landscape. Understand the fundamentals of landscape painting, specific skills & techniques for plein air painting. 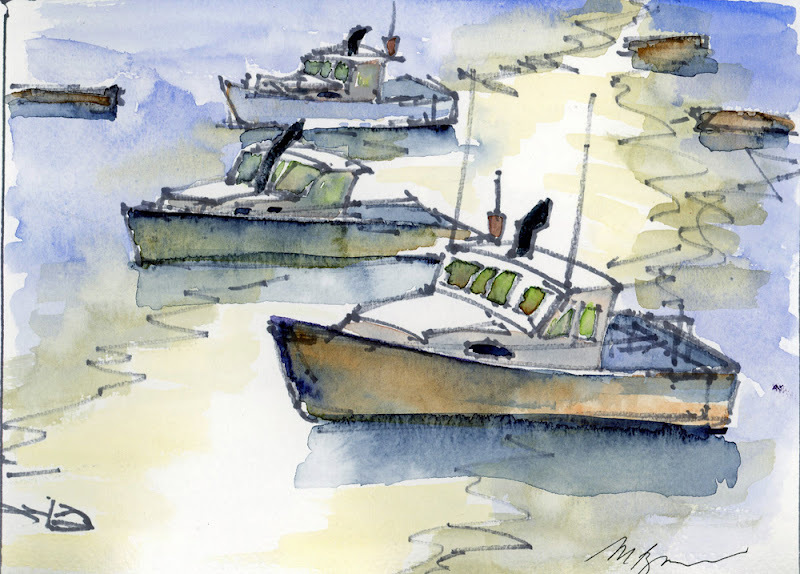 Streamline your plein air painting. New weekly location- Diverse subject matter. Individual expression, growth & creativity are encouraged. CLASS FEES : 4 week class session is $160. Single class $55 per class. There are no make up classes. Single class purchase here individually for $55 per class. There are no make up classes. The western skies at sunset are dramatic and beautiful at this time of year. Before I was swept into my busy summer schedule this past June I began to share my story on how I started my journey into plein air painting. I was a studio painter for many years before I ever stepped outdoors with a paint brush and paints. Painting out doors changed me in many ways. As a studio painter I painted abstracts. I worked with oil, acrylic, watercolors, collage and assemblage. Outdoors I work with markers, pens, pencils, oils, watercolors and acrylics. Studio painting was about materials, expression and experimentation, with no model or subject matter to look at. The process was all about paint and form. Plein air painting is about materials, expression, interpretation and experimentation, and I have a constantly changing subject to paint. And that subject surrounds me! When I first started to paint on location I kept the paintings to remember where I painted and how I handled the conditions, not because I liked anything that I painted. My paintings weren’t even close to what I hoped to capture of the scene in front of me. I used to bring my paintings home and line them up on the floor in front of the couch. I’d ask my husband what he thought of them. He’d look them over and encourage me to keep at it. One of his early observations was that from across the room they looked good. Only when you got up close could you see what a mess they were. I realized then that at least I was getting the form and value right. 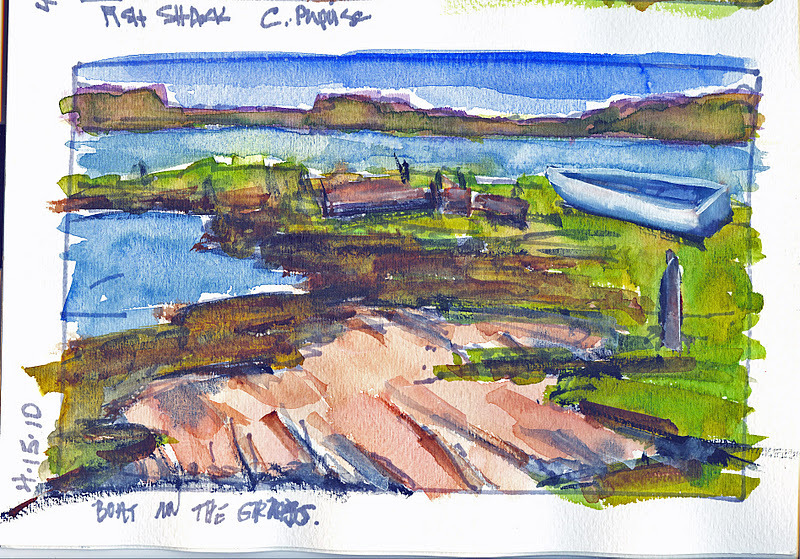 I began to keep track of my progress, took notes and started to make a sketchbook of all my plein air locations. 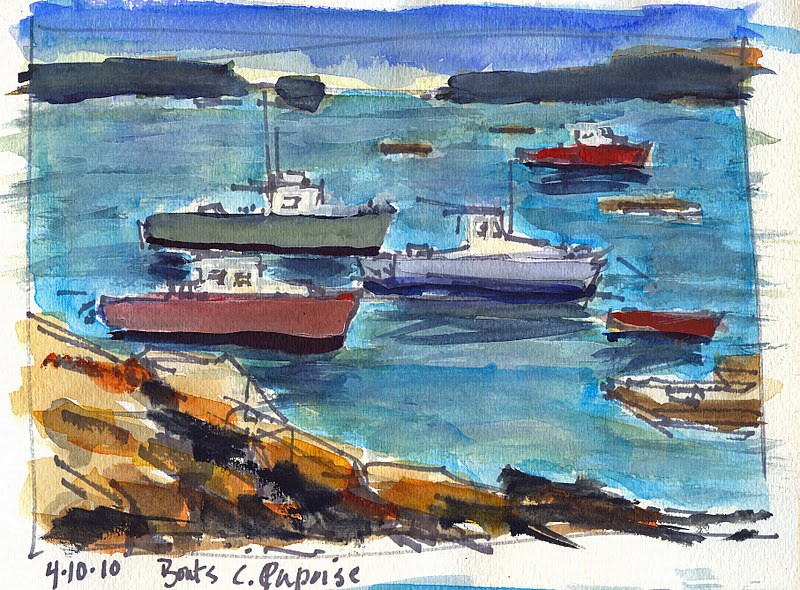 I showed my plein air work to other painters and received some good feedback, then continued on. I wanted to paint outdoors as skillfully as I painted in the studio. Painting on a warm November day in a quiet, sunny location. I love teaching my new studio class. We are going deeper into explorations of color and techniques. I love watching my students really gain insights and develop their skills. Their speedy growth is amazing me. They are on their way to becoming good, solid painters. I am opening up enrollment for my new Tuesday Studio Class. Since there is enough interest, I am adding on a class. If you spoke to me or emailed me regarding a spot in my FILLED morning studio class please contact me ASAP if you would like to be in this afternoon class (2-5pm). If you work with oils, watercolors, gouache or acrylics and are interested in joining us send me an email. Class is ongoing in 6 week sessions. There is one make up class every session for (sick/ice/snow days) if needed. Class size is limited so early registration is suggested. PLEASE CONTACT ME TO SECURE YOUR SPOT. PLEASE NOTE: Class size is limited. The response has been immediate when I have listed a class opening. As of now I am not advertising this class publicly, I’m only sending notifications to my email list and blog. Please contact me if you want to be in this class as registration is now open. Everyone who is on my wait list will have first option to register for this class. YOU MAY REQUEST TO BE PUT ON THE WAITING LIST FOR THE JANUARY CLASS SESSION HERE. Join my email list for the latest scoop. See reports from the field here. Share good news with friends! New Painting Class Starting January 19th. I’m offering a new painting class beginning on January 19th. This is a return to my roots after a few years of focusing solely on painting. The new year feels like a good time to start teaching again and sharing what I’ve learned and discovered. I love both teaching and taking classes and workshops. I gain so much from exposure to another artist’s thoughts and from observing their painting process. It helps me gain a new perspective on my work and on my approach to painting. These experiences enable me to see my work with “fresh eyes” and to understand what I can do to improve my paintings. I’m offering classes so others can benefit from my experience in the same way I have from my instructors. The first 6 week session of the January class focuses on building your confidence with techniques and painting skills. Each participant will receive personal guidance in their development. For a detailed description of the class go here. If you have any questions please email me. I love painting at night! It is one of my favorite times to paint. It takes me back to my childhood when we spent long summer evenings outdoors catching fireflies or going fishing. It is so mysterious and fun to be outdoors after dark . Painting at night has the same quality. It’s outside the boundaries of “regular” painting times. The owners of a fabulous, grand old house in town stopped by to visit me on the beach at sunset. They had just arrived in town and were excited to see painters were everywhere. I told them I was painting a nocturne and they offered to light up the whole house so I could paint it. When I saw it I couldn’t resist! I sketched and laid in the painting starting around 9 pm. It was getting pretty dark by 10. The blue in the western sky was dim and the trees loomed huge and dark. The house glowed like a birthday cake. Passing cars slowed down to look. I laid out my colors so I could see them with my head lamp. I painted values in the dim light. It looked finished when I packed up sometime after 11. I was having a conversation yesterday with another painter. It was about break throughs…and the process freeing yourself from “rules” stuffed in your head. If you’ve had a lot of art instruction you might know what I am talking about. I had a painting instructor who gave the class an assignment for a studio painting developed from a plein air sketch. I painted a barn with a flag blowing in the breeze. After seeing the painting he didn’t allow any buildings as subject matter for future class assignments. I noticed the paintings he painted were dozens of pictures of a fruit, vegetable or flower housed in cozy, old wooden boxes. What’s a box? A cube. What’s a building? A cube. What do I remember from this painting class ? Perkins Cove is a narrow deep cove with boats moored in neat rows. It is a very orderly harbor and its busy year round. They have their own little ice breaker to keep the water open so the boats can go out on cold winter mornings. You know spring is just around the corner when the ice breaks up on Great Bay. All these little icebergs bob around then float out to sea on the tide.